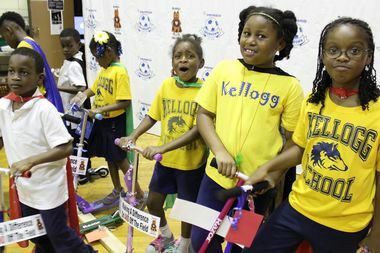 BEVERLY — A loud cheer filled the gymnasium at Kate S. Kellogg Elementary School Tuesday afternoon as students in kindergarten through third grade learned they were getting new scooters. Several of the 110 students at 9241 S. Leavitt St. in Beverly fist pumped as a curtain on the school's stage opened to unveil the scooters, which came courtesy of the PepsiCo Showdown. Some 21,500 high school soccer players participate in the tournament from 216 high schools. Each of them pitched in $1, which paid for the new scooters, said Joe Trost, a spokesman for the event. "Now we want you guys to go out yourselves and pay it forward with a random act of kindness," Trost told the excited children. Principal Cory Overstreet explained to students that the scooters would be distributed in the coming days, just to be sure everyone received a new one as keeping track of the handouts would have been nearly impossible in the buzzing gym. "I think that's the No. 1 thing we can take away from this is how can we be kind to others," Overstreet said. Trost said tournament participants have been doing monthly good deeds throughout the year. In March, players handed out new bikes to a school on the North Side. This time, they headed south and decided to give away scooters. He added that organizers of the tournament were looking for a diverse school where the gift would be appreciated. Kellogg fit the criteria. Magic Little, 6, is a first-grader at Kellogg. He said he could certainly use a new scooter, though he wasn't entirely surprised by the announcement having peeked inside the gym ahead of the assembly. "I knew it was scooters behind the curtain," he said with a sly grin.